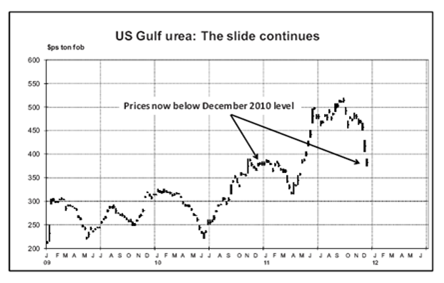 Christmas has arrived early this year for U.S. urea buyers thanks to the Euro crisis!!! In the last two weeks, Green Markets reports urea price reductions over $65 per short ton f.o.b. NOLA while Profercy reports NOLA purchases at $375 per ton. The November NOLA average hovered at $470. That puts things in perspective. What we are hearing is that the problems aren’t just the weak Euro depressing fertilizer (and grain) prices; the bigger worry is that the Euro will actually collapse as a currency. Any transaction caught in the middle if/when this occurs will likely not be paid, be paid very late, or at a steeply discounted rate in some other currency (eventually). Traders aren’t making deals because they are scared. “A picture is worth a thousand words”, the old saying goes. Check the graph below. Back in June, we passed along a market prognostication concluding with others that (1) world inventories of Urea would remain tight through December, (2) there would be no major build-up of producer inventory (product would be sold as it was produced), (3) any price reversals would be temporary, and (4) prices would continue to trend upwards. We could be a little embarrassed, but this topsy-turvy world economy is mystifying to everyone including us. Is it the see-saw 1930’s all over again? We don’t know. One thing for sure – deficits and government debt are scaring the daylights out of everyone. On the fertilizer supply side, U.S. and Canadian natural gas remains cheap keeping domestic manufacturing costs down, the fertilizer market is in its seasonal ebb as northern hemisphere markets shifts to the southern hemisphere. Imports are strong because Europe is weak(er). On the demand side, Europe is sitting on held-over urea inventory from last season, Indian purchases are soft, speculators are trying to unload long positions, and U.S. buyers are wondering how low pricing can go before winter-fill to replenish warehouses for spring. So this is the market snapshot in December – a far cry from six months ago. From all of us at Cervantes-Delgado, Inc. (CDI), we wish all of you a very Merry Christmas and a Safe and Prosperous New Year!